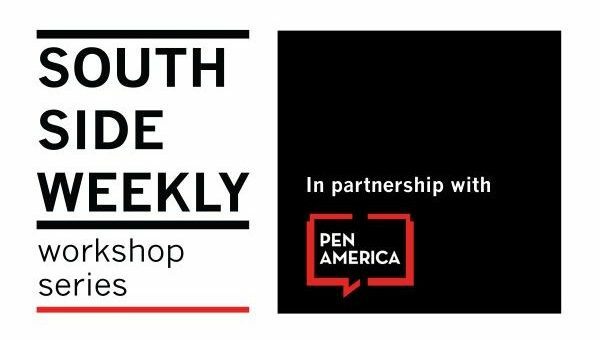 PEN America is partnering with the South Side Weekly on a series of eight hands-on workshops for different journalism skills. In this workshop, the first in the series, participants will learn how to request documents under the Freedom of Information Act and how they can help you with your reporting. You’ll learn how to make a request, what to do if your request gets denied, and other FOIA tips and tricks. If you can, bring a laptop to have the opportunity to make a practice FOIA during the workshop. Emeline Posner is a co-managing editor of the South Side Weekly and a freelance copy editor and writer. Prior to this, she was the Weekly‘s Food & Land editor, editing stories about urban agriculture, environmental justice, zoning, and land use. Her favorite agencies to FOIA are the IEPA and the Metropolitan Water Reclamation District. Sam Stecklow is a co-managing editor of the Weekly and a journalist with the Invisible Institute. He has previously been published by or worked for a lot of websites that don’t exist anymore, like Gawker, The Awl, Select All, Ratter, Fusion, and DNAinfo. He’s also been published by some outlets that still exist, like Chicago magazine and the Chicago Reader, and some that are in between, like Chicagoist. In 2016, he won a Sidney Award from the Sidney Hillman Foundation for his reporting on the Fraternal Order of Police. More information on each of the eight workshops can be found here.